"You want a ring? I got a ring for ya. In my bathtub." Sylvester Stallone’s big break came in 1974 when he starred with Henry Winkler as gang member "Stanley Rosiello" in this underappreciated (and extremely low-budget) coming-of-age movie set in the Flatbush community of Brooklyn, New York, in 1958. Winkler portrays "Butchey Weinstein," while Perry King is "Chico Tyrell" and Paul Mace is "Wimpy Murgalo." It's great to watch Stallone and Winkler on the verge of superstardom. Not much happens as the "plot" rambles along and basically revolves around the gang chasing girls, making out at the drive-in theater (which shows From Here to Eternity), playing pool, starting fights and stealing cars. The whole thing has a grainy, home video feel to it. Stallone gets some of the best lines (see above) and reportedly was allowed to improvise some of his dialogue. The film was directed by Martin Davidson and Stephen Verona. Look for Susan Blakely (The Towering Inferno) as Chico's rather timid love interest, Jane, and Ray Sharkey in his film debut as one of the high school students. Tragically, Mace died in a car accident in 1983 at the age of 33. The Lords of Flatbush would make a great double feature with The Wanderers (1979) — Dolph Sweet plays the "grouchy old guy" in both movies. Useless Trivia: Richard Gere was originally cast as Chico but he did not get along with Stallone, who demanded that he be fired and replaced with King. The two actors reportedly even got into a fist fight! 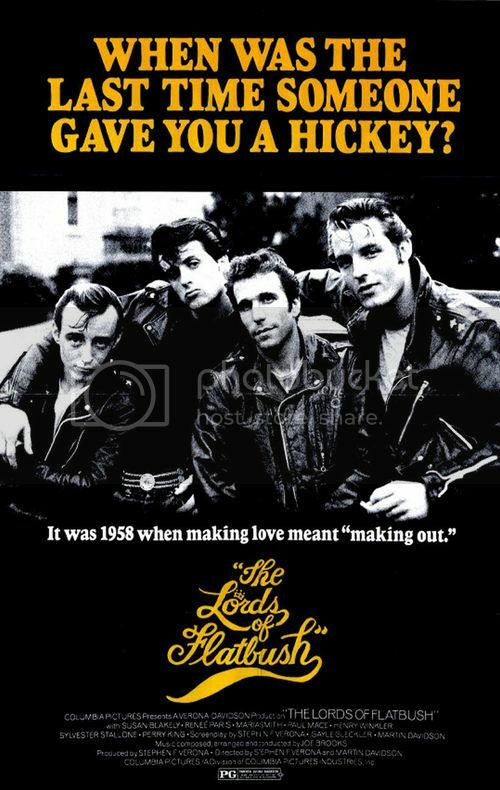 • Stallone once remarked, "When The Lords of Flatbush came out, I thought it was going to be my entree into movies. But nothing happened."